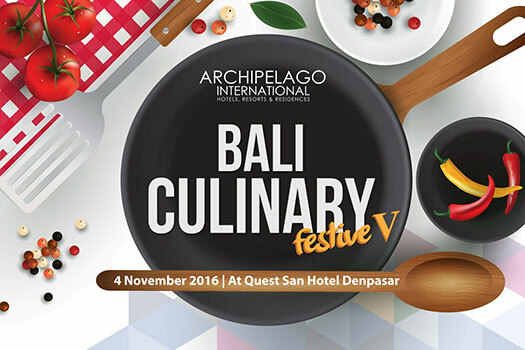 Bali, October 31 - Archipelago International will host the fifth annual Archipelago Culinary Festive on Friday 4th November at Quest San Hotel Denpasar Hotel. The Culinary Festive welcomes a stream of talented chefs, bartenders and servers from 18 hotels under portfolio of Archipelago International in Bali and Lombok. The exclusive event will see the participants putting their skills and talent to test in some challenges including the Black Box cooking competition – the true test of a chef’s worth and ability to work under pressure, mocktail creation and innovative table setup competitions. Essentially, for Black Box and mocktail creation challenges will involve the competitors being handed a box of ingredients and given a limited time frame to use all ingredients provided to create an amazing dish and tasty mocktail. Competitors will be judged by Winston Hanes, the Director of Operations and creator of the esteemed event, and Chef Mandif Warokka, alongside culinary professionals. "The Archipelago Culinary Festive is an exciting opportunity for the F&B staff in our hotels to highlight their skills and to be inspired by the creativity of their sister properties. The bartending and cooking competitions create both networking and competition among the hotels to be the best of the best. This type of training and teambuilding is what makes Archipelago International the number one hotel operator in Indonesia,” said Winston Hanes, the Director of Operations of Archipelago International.